The Compute interaction functionality tool determines the correct sign of the interactions in a LRG according to the logical rules defined for each node. These rules, are used to compute the conditions for which a given interaction has a dual, positive, negative or no effect. The perturbation selection, where the user can select (and define new) perturbations. The save report button, where the user can export a summary table of all the conditions of each interaction into a XHTML file, to be visualised in a browser. The execution options, where the user can run the computation and visualise the colors computed by the method or restore the colors of the original graph. Left: The interaction functionality dialog box. Right: The logical regulatory graph, where the sign of the interactions are highlighted. After running the tool, the logical regulatory graph interactions will change colour depending on their function. Their colour code representation will be: green, for interactions having an activatory effect; red, for interactions with an inhibitory effect; blue, for interactions having a dual effect; and black, for non-functional interactions. Additionally, if the user correctly (incorrectly) defined the sign of the interaction, this will be represented in normal (increased) thickness. A summary table, where for every interaction, it shows the source and target node, the user defined sign and the computed sign. A detailed table, where for every interaction, and for all the valuations of the regulators of the target node, it shows the cases for which the specific interaction is functional. 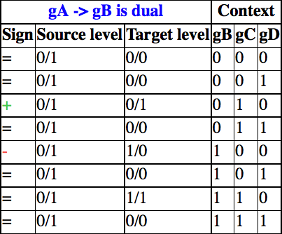 For all the valuations of all regulators of target node gB, the cases for which the interaction gA -> gB is functional are shown. Highlight local graph was implemented in GINsim 3.0.